Save big on Malvern Hanley and Charford garden offices! A fantastic garden room made with Western Red Cedar offering unparalleled performance, natural warmth and incredible durability. Glass to ground double glazing allows natural light to pour into the building, giving you the feeling of being out in your garden, all year round. 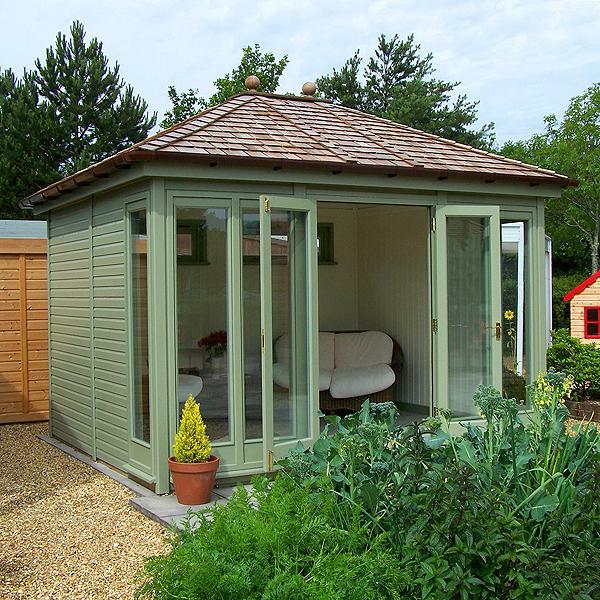 The Hanley Garden Room is available with a choice of three different roof styles to suit all requirements - Apex, Hipped or Flat. 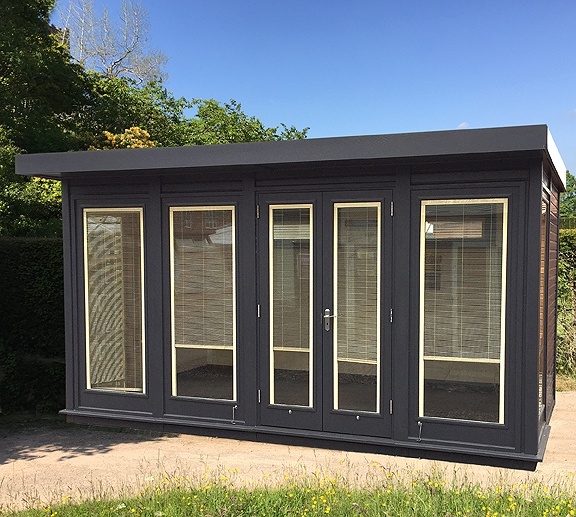 Double glazed throughout with energy saving glass and insulated to the walls, roof and floor to a high standard (see technical specifications below) which makes this garden room available for all-year round use! The Hanley is available in either glass to ground glazing, or half glazed casement/vent windows and a half glazed door. Two privacy ventilation windows are also included at the rear of the building. Extra windows and doors can be added if desired. 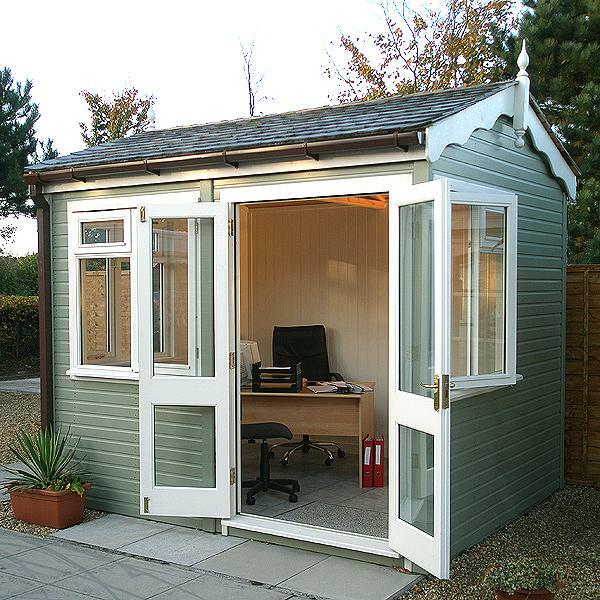 Why Choose a Malvern Hanley Garden Office? Western Red Cedar (Thuja Plicata) is a contemporary yet classic building material offering beauty, versatility and durability. Western Red Cedar is preferred where attractive appearance, superior performance and resistance to weather are paramount. Cedar has a very low shrinkage factor and is therefore highly resistant to warping, twisting and shrinkage. The shiplap walls are lined with a breather paper membrane. The walls are constructed using 44mm x 69mm Scandinavian redwood. The cavity is then filled with 50mm foil backed insulation board. Internally, the walls are lined with 9mm painted MDF. 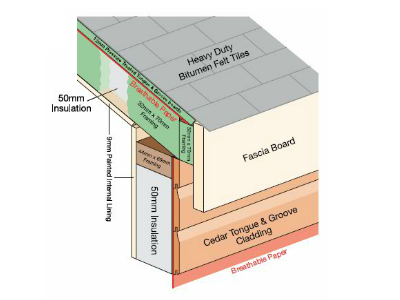 Heavy duty 19mm Pressure treated deal tongue and groove boards are fixed to 44mm x 69mm pressure treated joists with a breather paper membrane sandwiched between. Techniboard insulation is laid on top of the internal floor. Heavy duty bitumen roof tiles (available in black, green or red) are laid onto 12mm pressure treated tongue and groove boards. The flat roof version has a one-piece heavy-duty rubber roofing membrane cover. 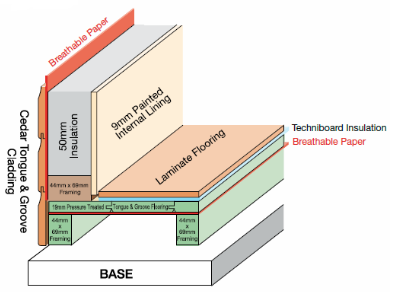 A breathable paper membrane is sandwiched between the roof boards and the 32mm x 70mm pressure treated redwood roof joists. 50mm foil backed insulation fills the cavity between the joists and 9mm painted MDF lining placed on the inside. UPVC guttering is fitted as standard to the rear of the pent and flat roof models and available as an option on the apex and hipped models. Buildings are treated with a high quality Teknos painted finish comprising of an undercoat and 2 coats of your chosen colour. All windows and doors are made from Western Red Cedar and fitted with double glazed units using 4mm toughened glass with Planitherm heat loss coating as standard. All opening windows are fitted with lockable key catches and all doors are fitted with a 5-lever mortice lock and brass/chrome handles. Choose between glass to ground windows and doors or half glazed casement/vent windows and a half glazed door. 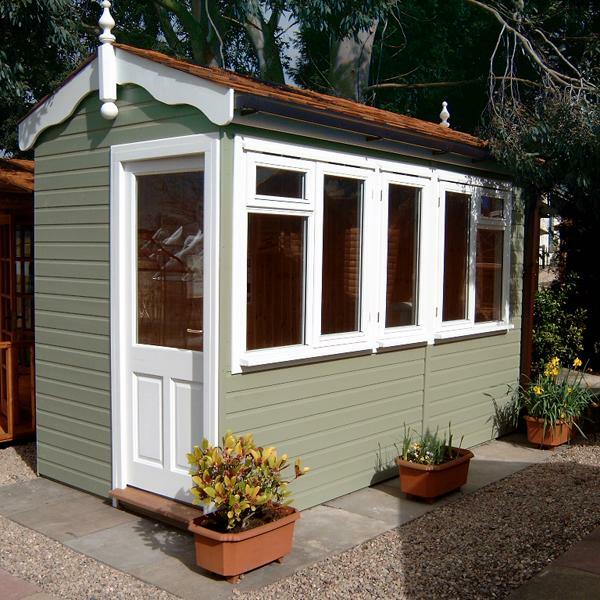 All Malvern Garden Rooms come with a 10-year timber guarantee against rot and decay. This guarantee is subject to all exterior paintwork being maintained in line with the manufacturers' recommendations. All other workmanship and materials are guaranteed for a twelve-month period from date of installation. *Please note the Hanley is subject to some geographical restrictions in Scotland. Please speak with us if you are interested in this product and are concerned you may be affected. 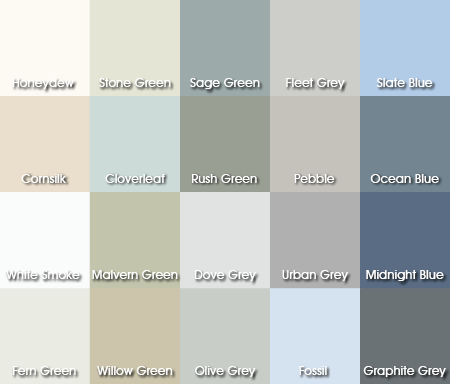 The Malvern Hanley has the option of a painted finish and you can choose from 20 countryside colours! We can also paint the windows and doors in an alternative colour to really make the building your own. Upgrade your standard floor to a deluxe laminate floor which is available in a choice of finishes. Add a velux window to your roof for additional light and air circulation. A privacy vent window is a rectangular window, normally positioned high up on your garden office wall. When open, it increases air-flow but retains privacy. Add integral window blinds for a contemporary and practical solution to office privacy. Add extra doors or windows for additional access and natural light into your office. Create separate areas such as a storage cupboard or even a kitchen area within your garden office with a partition wall. This stunning Malvern Hanley garden office has a Western Red Cedar shingle roof with large windows and double doors for maximum natural light. 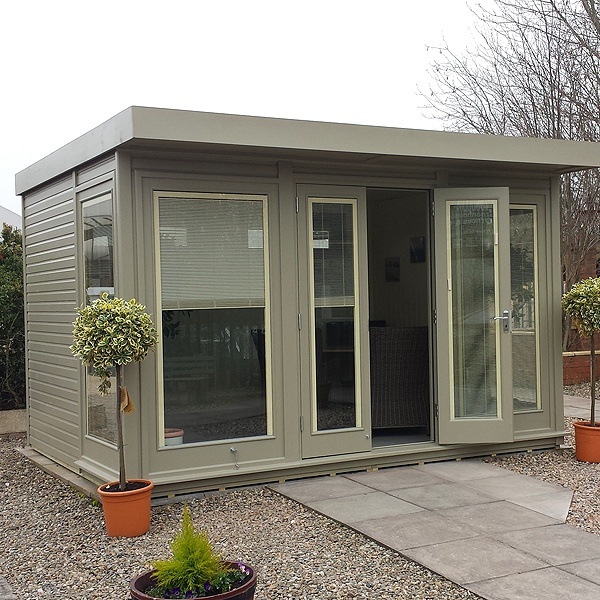 Every Garden Office is individually built for our customers and this is no exception. This one has painted cedar external cladding for long life and good looks, blinds within the sealed unit double glazing for shade and privacy, and the door fitted in the gable end for convenience. This 12ft x 10ft Hanley with a hipped roof, is a working office for a pool supplies company and provides a warm, clean and functional environment for them to operate from. You will see that the eaves on this example have been finished with cedar shingles ... this is optional on all of our garden offices and outdoor rooms however, if you wish to fit guttering you will need to specify painted bargeboards rather than the shingles. 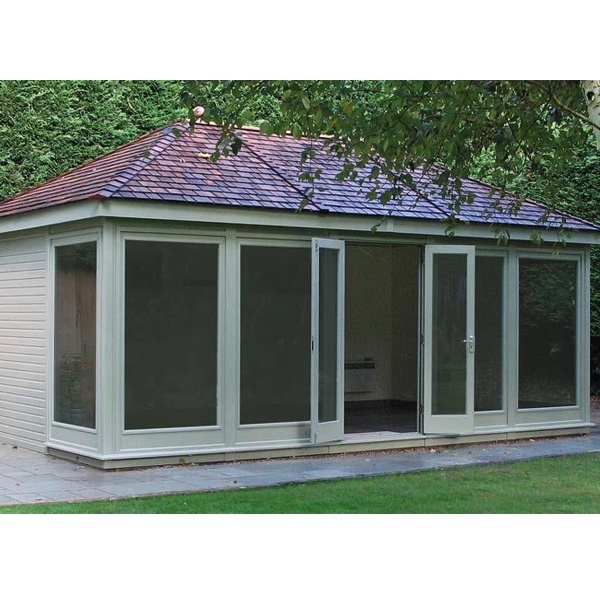 All Malvern Garden Offices are installed by the manufacturer's bespoke fitting teams. They all contain toughened safety glass. You can see why 'Malvern Green' is the most popular colour choice in our office range. This Hanley has a cedar shingle roof rather than bitumen felt tiles which are standard. The two rear vent windows and an optional velux window cast additional light onto the tiled laminate floor (also one of the options available with all of our garden offices). Our expert fitters install every Hanley to ensure that they are assembled to the highest standard. This Hanley is finished in Malvern Green on cedar external cladding.The interior mdf lining is 'Honeydew' making it bright and clean inside. The roof is attractively styled and, in this instance, is finished with cedar shingles for good looks and durability. Note the plain bargeboards, used in this instance as the building is fitted with gutters and downpipe. Other pictures of the hipped roof Hanley on this page show a cedar shingle facia. 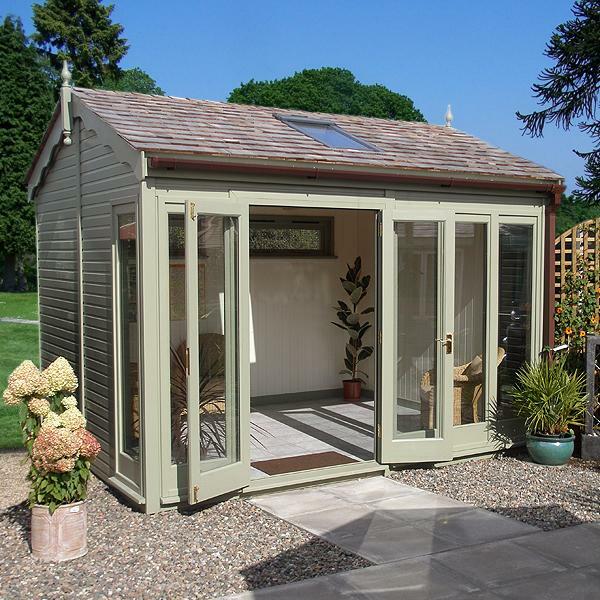 All Malvern Garden Offices are installed by the manufacturer's bespoke fitting teams. Toughened safety glass is used in all windows and doors. This 10ft x 8ft Hanley has a number of added features. This building has Cedar shingles on the roof, a tiled laminate floor, gutters and downpipes. 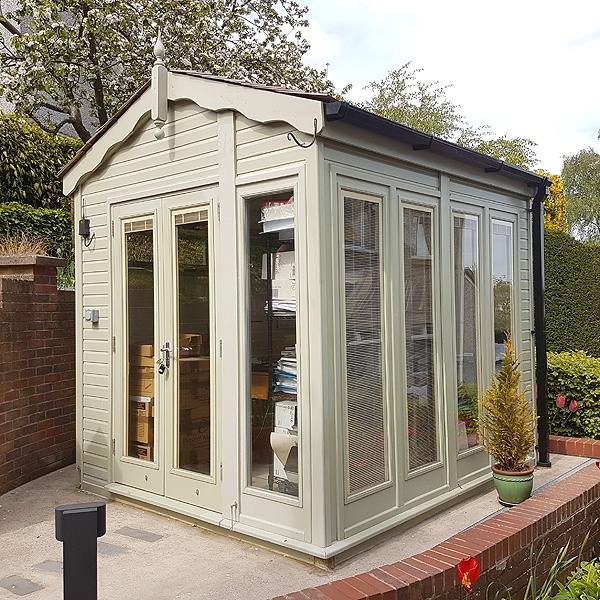 The external cladding of all of our Garden Office range is Western Red Cedar which has then been painted in 'Malvern Green' colour. The windows and doors are painted with 'Honeydew'. The inside is lined and insulated for all year round use. This Hanley displays the half glazed casement vent windows choice. The other being glass to ground windows, as seen elsewhere in the gallery. The Haney is a high quality, multi functional building which really needs to be seen to be appreciated : cedar external cladding can be painted to a colour of your choice and doors and windows positioned as required. Installation is carried out by our teams of skilled fitters to ensure that every job is finished to the exacting standards you would expect. This 12ft x 6ft Hanley Garden Office required access from the end rather than the front. A set of windows along the front face provided plenty of light for our customer. The paint finish is Malvern Green with Windows and doors in White. Optional cedar shingle roof and gutters are fitted. This compact version of the Hanley with its flat roof has a height of less than 2.5m which means that, as a general rule, no planning permission is required ( although its always advisable to check with your local authority first ). Look carefully and you'll see that blinds are built into the double glazed panes to make the working environment more comfortable and private. Of course, these aren't always purchased for work purposes ! They are equally at home as art studios, hobby rooms, or just somewhere to sit and relax in the knowledge that you have bought the best. This is a very good example of the Hanley with standard Medium Oak finish externally. The pine tongued and grooved lining is optional since a painted mdf lining with insulation is standard. The roof is covered with bitumen felt tiles, black in this case but red or green are also available. The two rear vent windows give light and ventilation and can be supplemented by fitting a velux roof window. This building is in use as a comfortable additional living area rather than as an office ... it could equally well be used as an artist's studio, a playroom or a home gymnasium! The Hanley Garden Office shown to great effect in this superb location. Shown here is a Hanley Garden Office in standard 'Medium Oak' finish. This particular model benefits from 2 additional casement windows, laminate flooring and red felt roof tiles. The one piece heavy duty rubber roofing membrane cover makes it watertight and ensures a consistent quality of performance over the years. When you invest in one of these buildings you are adding a real touch of class to your garden. Pictured in the evening, this building is finished externally in Rush Green on cedar cladding, it has a painted internal mdf lining, cedar shingle roof, gutters and downpipes. This 14ft x 10ft hipped roof Hanley is finished in Moss Green. This 14ft x 10ft Hanley looks fabulous ....it's finished in the standard Medium Oak colour and the internal walls are completed with pine boarding rather than the standard insulated mdf lining. As each Hanley is built to order you can specify door and window positions, window styles, cladding colours and roof finishes. I've included this picture to show the 'Radius Corner' version of the Hanley. This is a good example of the flexible approach Malvern are able to take when constructing Garden Offices.. translating customers ideas into reality. The colour isn't from our normal range either ... but we have painted buildings bright green and yellow before now to match our customers' requirements ! 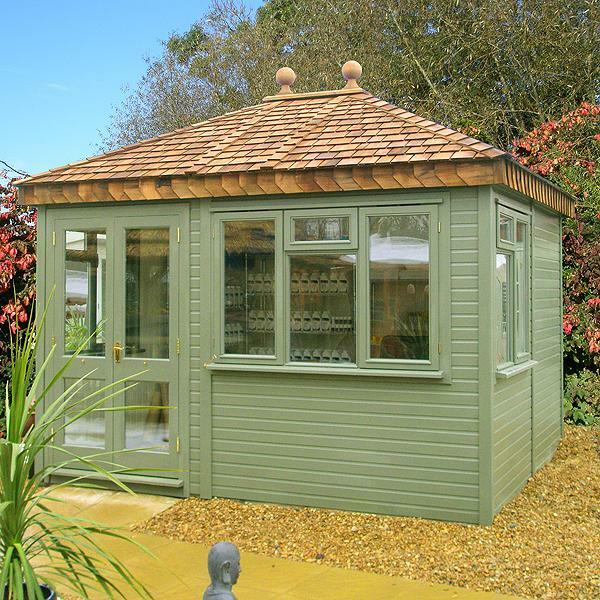 Pressure treated Canadian Western Red Cedar shingle roof tiles are an attractive option on our garden office range. Laid on top of a mineralised bitumen roofing felt, the roof will therefore be totally weatherproof. Pressure treatment ensures that preservative penetrates deep into the cedar shingles. Here the MDF is finished in 'Honeydew' paint finish which gives the room an airy and spacious feel. Roofs, floors and walls are fully insulated to make these buildings suitable for all year round use. This illustrates the use of our standard Medium Oak finish on Cedar cladding. Canadian Western Red Cedar contains its own natural oils which protects it against rot. It is a beautiful, almost knot free timber which will give many years of service and is used extensively around the world because of its suitability in most weather conditions. Pictured here is one of the range of deluxe laminate floors available for our Garden Office range. 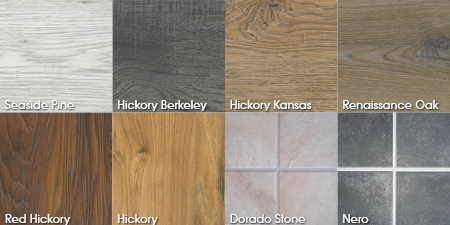 We also have a selection of tiled laminate floors available. Two vent windows (only one on 8ft long model) are fitted as standard in the back wall of every Hanley Garden Office to provide ventilation and light. There are two lockable casement stays and two trickle vents on each window. This optional half length window gives extra ventilation at the front corners of the building. Available when glass to ground windows are selected. Optional with the Hipped roof and Apex roof versions of the Hanley, a Velux roof window provides high level ventilation and light. Shown here just after installation, the instruction book is still fixed to the glass !